Home › Blog › What Happens When You Stop Drinking Alcohol? Not drinking alcohol may seem like a daunting task, especially if you have been drinking too much or are physically or mentally dependent on alcohol. While there are certainly ads and commercials portraying the fun and excitement of drinking alcohol, there aren’t many boasting about the benefits of quitting drinking alcohol or even the risks of drinking too much. Quitting drinking offers both immediate benefits as well as benefits that you will enjoy over time. Whether you are taking a temporary break from drinking or are putting down the bottle for good, the benefits you’ll experience affect every aspect of your life. Drinking heavily for an extended period of time can wreak havoc on the body. If you are physically dependent on alcohol or have consumed high quantities of alcohol for a while, it’s best to attend a medically assisted detox program when quitting alcohol. When the body is dependent on alcohol, it can go into shock when you first stop drinking. Once the body is fully detoxed from alcohol, you will begin to notice immediate benefits of when you stop drinking. Nearly every organ and system in the body is affected by alcohol, so once you stop drinking, these systems and organs are able to return to normal. Immune system — Alcohol can weaken the immune system, making it harder to fight off illnesses and diseases. Once an individual stops drinking, the immune system is able to heal and will be able to ward off sickness. Heart — Our hearts are greatly affected by alcohol abuse. The heart can become damaged and the muscles around it can weaken, making individuals more prone to heart attacks, irregular heartbeat, strokes, heart disease, and more. Liver — The liver is also affected by excessive alcohol use. This organ is responsible for breaking down any substance we put into our bodies. Alcohol abuse can lead to a buildup of toxins in the liver, as it is unable to break down the substance fast enough when consumed in high quantities. Once a person stops drinking, the liver is able to process the toxins and substances that have built up over time. Weight — Drinking alcohol on a regular basis can lead to weight gain. Alcohol is mostly empty calories and can cause the metabolism to slow down, resulting in added pounds to the body. When an individual stops drinking, they’re eliminating those excess calories and also allowing the metabolism to begin functioning normally again. The benefits that can be felt in the body are just the beginning of the positive effects that come when a person stops drinking alcohol. Your brain will also experience a number of positive changes that can be felt soon after giving up the drink. When alcohol is consumed in large quantities, it can slow the communication between the brain’s neurotransmitters and neurons. This can interfere with a number of major functions in the body, including speaking, movement, breathing, and thinking. Concentration — Many people reportedly feel more mentally clear and less foggy and have noted an increase in their ability to concentrate once they quit drinking alcohol. Memory function — A brain constantly exposed to alcohol can cause memory loss or decreased memory function. When you stop drinking, the brain will be able to store memories more efficiently for increased memory function. Better sleep — Alcohol consumption disrupts sleep and can cause individuals to wake up feeling groggy and unrested. The body continues to break down alcohol while we sleep, so it does not truly get to rest after consuming alcohol. When you give up drinking, you give your body and mind the ability to truly rest while you sleep, so you’ll feel better and more rested in the morning. Mood — Because alcohol is a depressant, long-term use can have a negative effect on an individual’s overall mood. This is especially true for individuals who are prone to depression, as alcohol can make depression worse. However, when you stop drinking, your mood should stabilize and you will feel better in general. The benefits of not drinking alcohol span across every aspect of an individual’s life. A person’s overall well-being is positively impacted when he or she stops drinking. And, it’s not just limited to physical benefits. Not drinking can also mean better grades and attendance in school, higher performance at work, and better functioning within relationships. More severe symptoms include hallucinations, seizures, and delirium tremens, or DTs. Symptoms of DTs are extremely dangerous and require medical attention immediately. They can be life-threatening if medical help is not sought. If you believe that you have an addiction to alcohol and are physically dependent on it, it’s important that you seek medical treatment before beginning the detox process. Once an individual stops consuming alcohol after abusing it for an extended period of time, the body can go into shock and uncomfortable and even dangerous symptoms can occur. A medically supervised detox program offers a comfortable place where people can safely withdraw from alcohol. Most detox facilities will provide 24/7 medical care as well as any needed medication to ensure the detox process is as easy as possible. When a detox program has been successfully completed, many people struggling with an alcohol use disorder choose to continue on to an inpatient or outpatient treatment program. Both forms of treatment offer individualized programs catered to a person’s unique needs and situation. Inpatient rehab programs are the most intensive form of alcohol addiction treatment available and require patients to reside at the treatment facility for a set amount of time, typically around 30 to 60 days. During their stay, patients undergo intensive treatment every day to help them recover from an alcohol use disorder. Many treatment facilities will center their programs around one form of treatment, such as behavioral therapy, and incorporate other types of therapy to provide a comprehensive approach to recovery. If a person is unable to attend an inpatient treatment program, there are many outpatient programs available that vary in intensity. Partial hospitalization programs and intensive outpatient programs are more focused types of outpatient treatment and require the individual to attend treatment several times a week. Regular outpatient programs are less intensive. 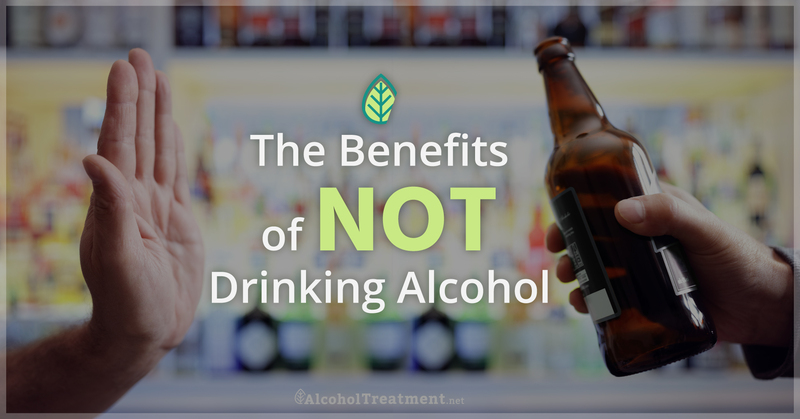 If you’d like to learn more about the many benefits that come with not drinking alcohol, and how to find treatment so you can reap these benefits, contact us today. How Many Drinks Per Week Is Too Much?